Take your taste buds for a wild ride on a cherry-go-round of flavor. Bolivia Black Cherry is rated 3.4 out of 5 by 11. Come one, come all, to the cherry carnival of your flavorful dreams. Complete with carbonated bumper cars, a tasty tilt-a-whirl, and not a creepy clown in sight. The price of admission? Just 5 calories, 1g of sugar, and no artificial sweeteners. So climb aboard, buckle up, and take your taste buds down the tunnel of love.We named our flavors after the coffee growing regions that inspired them, sort of like French Kissing or Bermuda Shorts. Learn about these regions and more here. You can keep your gold, silver and bronze. 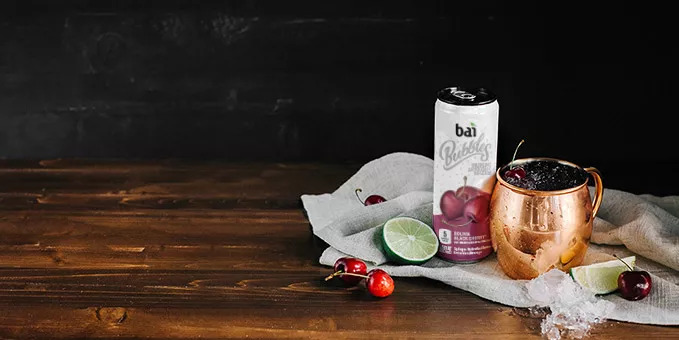 We know the real winner is a copper mug filled with the refreshing cherry kick in this Moscow Mule. Fill a copper cup with crushed ice. Pour lime juice, vodka, ginger beer, and Bolivia Black Cherry just on top of ice and stir together. Garnish with cherries and enjoy. 70mg polyphenols & chlorogenic acid from coffeefruit extract and white tea extract. 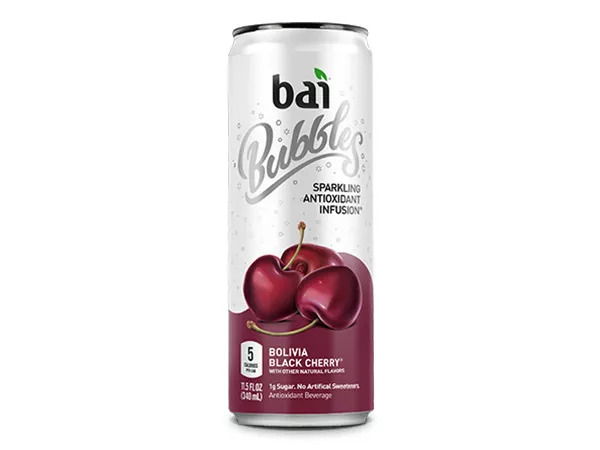 Filtered carbonated water, Bai® Proprietary Sweetener Blend™ (erythritol, stevia extract), natural flavors, cherry juice concentrate, malic acid, citric acid, fruit and vegetable juice (for color), coffeefruit extract, white tea extract, ascorbic acid, sodium citrate. Rated 5 out of 5 by DaveSontag from Best of all Bai Bubbles delicious, the best of the Bai Bubbles. Will buy more. Rated 5 out of 5 by Juarek from My favorite Personally like this flavor best. It’s a great substitute from soda and better for you. Keto friendly. Helps get me through moments when I need something sweet. Rated 5 out of 5 by Ava Marks from Best Flavor This is literally the best drink I’ve ever had. It is so flavorful. 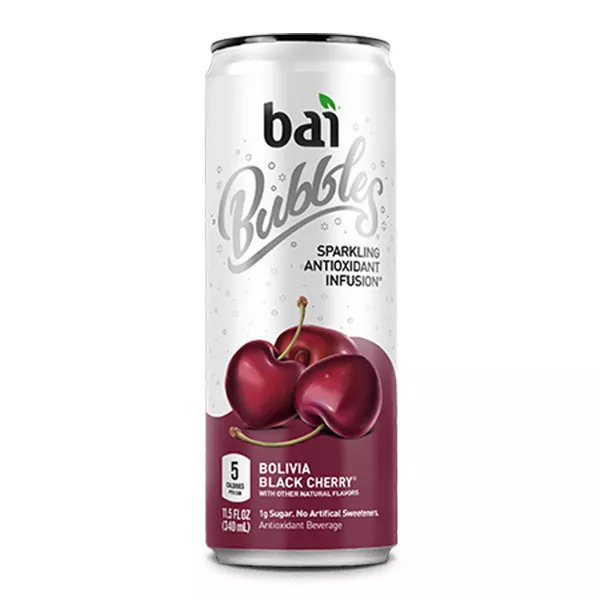 Rated 5 out of 5 by LMtz from Love Love Me Some Bai Bubbles! I had my 1st one 2 days ago. I was looking for a drink to help with a upset stomach..and had the regular ones b4. I picked this bai Bubbles black cherry and sipped it in less than a hr. Im no dr but I feel the bubbles helped my stomach issue and felt I had more energy. The taste was satisfying not over powering with the weird sweetener taste. Again I'm no dr or critic, that's the best way I can explain. I never had the normal energy drinks I usually just drink water. But I love Love Love me some BAI Bubbles! Definitely a Fan&will but again! Thanks Bai! Rated 3 out of 5 by Cbmn from Great taste but why the caffeine? Low sugar and no sodium, now if you could drop the caffeine. Rated 1 out of 5 by shadequeen08 from Taste like medicine If you like robitussin or any cough syrup this flavor is for you .